I was first introduced to Libby’s work during spring semester 2007 at a lecture she gave at CCA. I absolutely loved the lecture. I thought her work was so funny, odd, and inventive, with just enough neuroses to keep it interesting. I hadn’t gotten a change to see her work in the flesh so I was excited about getting to see her new work at the Heather Marx Gallery. This small solo show consisted of 10 pieces in various mediums. Three of the works were of her paper sculptures of luxury goods. There were two graphite drawings and 5 paintings. The two highlights of the show for me were a very large multi-itemed paper sculpture piece entitled “You Must Always Know How Long to Stay and When to Go” This piece is a camping kit complete with all the “essentials” for a women who want to camp in style. 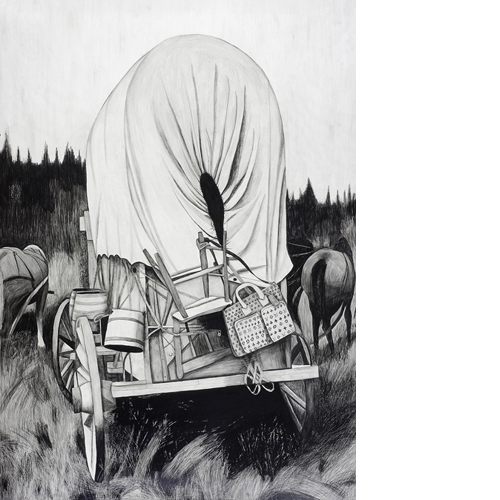 My other favorite piece was a large graphite drawing of a covered wagon with a Luis Vuitton strapped to the back. Though at first glance it is a fairly straightforward pencil drawing, her nervous hatchwork gives it life and energy. The care taken in rendering the wagon, surroundings and the belongings tied to the wagon gives you some insight into the intentions of the artist. The wagon becomes monumental both in size and the time and care it took her to render the drawing with so much detail. All of Libby’s work has a slightly sloppy, unfinished, nervous quality to it and for me this is most effective in the paper sculptures and in her graphite drawings. In the paper sculptures, the amateurish nature of the way they are constructed adds to their charm. They aren’t perfect, they are made from Libby Black the artist, and her hand is ever present. The paper sculpture piece I mentioned above is a charming camping kit that includes a cot, suitcase, Chanel manicure kit, Ralph Lauren polo shirts, a Last Flowers of Manet book, Giuseppe Zanotti sandals, Burberry lotion and a journal. The manicure kit is spray painted gold and has rough edges. The maker’s mark is obvious in nearly all the pieces and it is fun to imagine the processes she went through to make them. With all her paper sculpture pieces, my curiosity is always driven wild, trying to unravel the pieces in my mind to figure out how they were created. Other paper pieces in the show include a stack of hat boxes, horse reins, and camping kits, a painting of gold shoes entitled: There’s No Place Like Home, a stagecoach painting and a covered wagon painting. The overarching theme for the show is about journeys, leaving, homecoming, and of returning to a place you no longer recognize. She is dealing with the passing of time, feeling unsettled, and trying to find one’s way in the world. Libby uses the imagery of designer fashion to express her emotions. She seemed to be poking fun at her own emotions, trivializing them by manifesting them in the shallow products of an elitist and shallow luxury goods culture. Libby is transforming her relationship with these superficial luxury goods and using them in more complex ways with this new work. As well as being in conversation with the functionality and usefulness of these items, she is using them as a vocabulary tool to talk about more personal things in her life, such as her move back home to Texas. The work speaks as both tender and self deprecated. Her work used to be more about her own uneasy relationship with these goods. She was both drawn to and repulsed by the designer name world she grew up around. She has expanded on these feelings to extend into her life experiences. I think it’s a good fit. It allows her to explore more personal content while keeping the work light and comedic. She can both express and trivialize her own experiences without having to feel insincere or over-dramatic.